"Making the best of fusion installations in Europe"
With the recent addition of the Ukraine's Kharkov Institute for Physics and Technology (KIPT), the EUROfusion consortium now encompasses 30 European fusion laboratories. 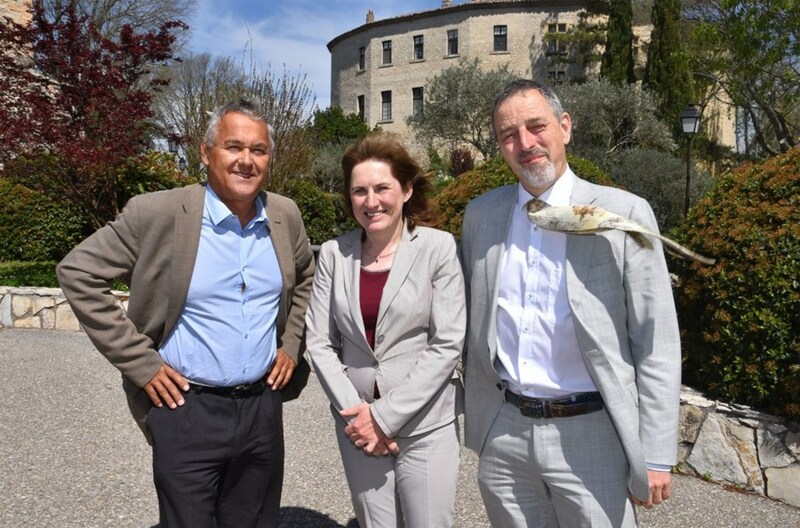 As its governing body—the General Assembly—convened last week at the Château de Cadarache, Newsline sat with Jérôme Pamela, General Assembly chair and former director of JET (1999-2006), EFDA (2006-2009) and Agence Iter France (2010-2016). The governing body of the EUROfusion consortium, the General Assembly, meets four times a year. On 11 April its members gathered at the Château de Cadarache for a two-day session. From left to right: Jérôme Pamela, General Assembly chair; Sibylle Günter (IPP), co-chair; and Tony Donné (DIFFER), Programme Manager for the consortium. How would you characterize the main missions of EUROfusion? EUROfusion, which in 2014 succeeded the European Fusion Development Agreement (EFDA), is responsible for coordinating the activities of the European fusion laboratories and institutions involved in fusion research and development. The long-term objectives are defined in the Fusion Roadmap, which aims at delivering electricity from fusion. Within this broad mission, the consortium has two main objectives: one is to prepare the European laboratories to participate in the scientific program of ITER; the other is to design the facility that will come after ITER—the pre-industrial demonstrator DEMO—for which pre-conceptual studies are presently ongoing. Regarding the first of these two objectives, what is in your view the "added value" provided by EUROfusion? Unquestionably, it is the shared utilization of selected installations and facilities such as JET (UK), ASDEX Upgrade (Germany), the variable configuration tokamak TCV (Switzerland), MAST-U (UK), WEST (France) ... and a few others. What is also important is that the EUROfusion research programs are established in common and implemented by joint experimental teams from the different participating labs and institutions. In my view this is an excellent example of what Europe can do—make the best of the specificities of existing fusion installations, work together and avoid duplication in fusion research. "A unique pool of expertise"
There are several reasons as to why EUROfusion is important for ITER. The first is the opportunity for the ITER Organization and the seven ITER Domestic Agencies to have a single point of contact for interacting with 30 European research organizations and universities on strategic issues of common interest for the development of fusion science and technology. The second is the unique pool of expertise, accumulated knowledge and high-quality equipment that ITER can call on to contribute to the design, development, manufacturing and assembly of the ITER components both now, in the present construction phase, and later, in the operation phase (which we have already started to prepare). We expect that some of the most talented scientists, engineers, technicians and operators trained and working as part of the EUROfusion consortium will be ready to join the ITER Organization when the project needs them. The third reason is the invaluable contribution of EUROfusion consortium labs to the advancement of plasma physics, which helps to prepare in a coordinated way for the decisive experiments that the ITER facility will allow the fusion community to perform and saves a lot of time and resources. Finally, EUROfusion is able to promote fusion within Europe and provide information in a decentralized way to the decision makers and the public at large in a way the ITER Organization never could. In a word, EUROfusion and the ITER Organization have a lot of good reasons to work hand-in-hand. DEMO will be a different machine, demonstrating electricity production and tritium self-sufficiency, with a level of performance expected to go well beyond that of ITER. Our approach to the design of DEMO is based on what I would call a "reasonable extrapolation" of ITER. We know that we will face some serious challenges ... take for instance the blanket modules inside the vacuum vessel. In ITER, they are designed to be "maintained" in case one module fails; in DEMO, due to the neutron fluence, the whole blanket will need to be replaced periodically. Do the pre-conceptual studies for DEMO benefit from the experience already acquired in ITER? One of the lessons learned from ITER is that we should not seek to optimize systems individually but focus intensely on the interactivity between systems. For instance optimizing the coolant is not only a matter related to the optimal operation of the breeding blankets, but one that also impacts the choice of materials, the penetrations through the walls, safety, other systems, plant efficiency, and costs ... to name just a few. In a few words, what was the outcome of EUROfusion's General Assembly? We had a very busy agenda this year. First we discussed the future of JET, for which deuterium-tritium experimentation is planned in 2019. In the context of Brexit, this requires an extension of the arrangements for using the facility; at the meeting we made useful steps in that direction. We also made important decisions to upgrade European tokamaks and some other facilities in order to progress a crucial question for fusion—that of the power exhaust, i.e., the control of power by the divertor. In Europe we will be able to explore the broadest set of options in that area, which will provide essential information to operate ITER and prepare DEMO.